Simulation movie of the activator model simulated an a topology extracted from an experimental template. 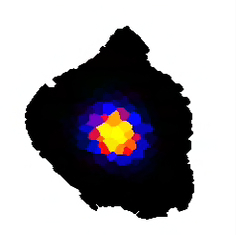 The simulation shows the WUSCHEL concentrations. The simulation starts with zero WUS concentrations everywhere and show the emerging WUS domain. Corresponds to Figure 6 in the paper Jösson et al, "Modeling the organization of the WUSCHEL expression domain in the shoot apical meristem. ", Bioinformatics, 21(S1):i232-240 (2005). Courtesy of Henrik Jönsson, Lund University.